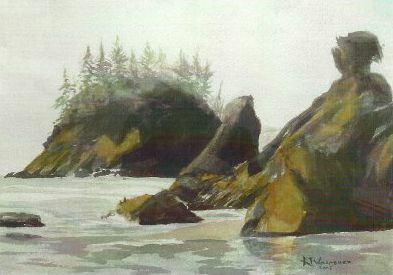 Her work in oils, acrylic and watercolor are mostly landscapes which have found homes in Alaska, the length of California, Hawaii, Idaho, Oregon, Washington, Montana, and Wisconsin. Winning awards and various color ribbons at the county fair keeps her competing and willing to show and share her work at various venues locally and San Diego, on periodic continuing bases. Otherwise her artworks can be viewed at her studio SOHOH, where orders may be placed for greeting and note cards, prints, and select originals. She has been known to barter even as she admits to gifting or purchases by family members.